It’s that time of the month again, and NPD figures have been released (almost didn’t happen this month). As explained in last month’s analysis, NPD is a marketing research firm that releases games console sale data every month. The Wii strikes back this month after last month’s slightly higher than normal Xbox 360 figures due to the release of Halo 3. This means that Nintendo is dominating both the next-gen (are we still calling it that, or is it “current-gen” now?) console and hand-held console market. 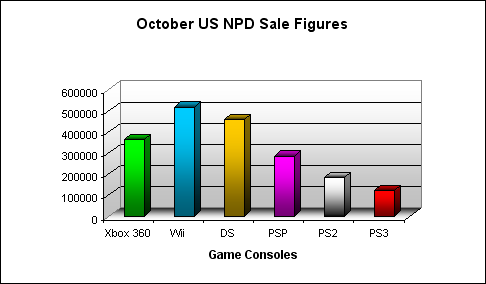 The PS3 is still struggling, although November’s figures should improve quite a bit due to the 40 GB PS3. PSP sales hold steady, while PS2 sales showed a slight drop. The next-gen market is still being dominated by the Wii and the 360, with the PS3 unable to make any sort of significant dent into the market place. The Wii held 51.6% of the market, while the Xbox 360 slipped to 36.4% after the high from Halo 3 subsided, with the PS3 improving slightly to 12%. 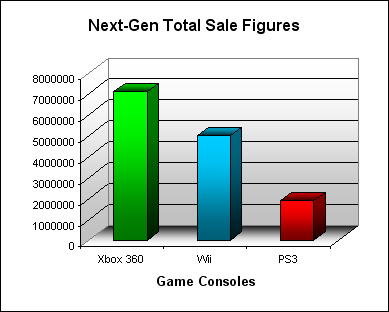 For total next-gen console sales, the Xbox 360 still holds a commanding 50.7% of the market, with the Wii quickly catching up at 35.7% and the PS3 steady at 13.6%. Note that these figures are highly rounded, +/- 0.5% variation to the actual figures may be present. The portable market saw Nintendo retain the lead, and the most popular portable game of the week was Zelda: Phantom Hourglass. Next month will be very interesting indeed with the new cheap 40 GB PS3 coming into play. Early figures suggest that sales have doubled for the PS3, but probably not enough to push it past the Xbox 360 – a strong 360 games line up including Mass Effect might blunt some of the gains made by Sony, and Microsoft has its own discounts coming into effect. This entry was posted on Saturday, November 17th, 2007 at 4:54 pm	and is filed under Gaming, Nintendo Wii, Wii U, Switch, NPD Analysis, PS3, PS4, Xbox 360, Xbox One. You can follow any responses to this entry through the RSS 2.0 feed. Both comments and pings are currently closed.